Meets IEEE C37.74 requirements including 3-time fault-closing on switches and fuse mountings. PSI/II Pad-Mounted Switchgear is designed to meet the switching and isolating requirements of electrical distribution systems with 15 pre-engineered switching configurations. There are UL®-listed standard units available to cover almost every situation – radial feed, loop feed and manual primary-selector switching. Special configurations and designs are available upon request. The three-time fault-close ratings, with the laboratory and field-proven Auto-jet® system can solve both your “near substation” high fault-current and mid-point loop switching applications as well as “distant end-point” standard fault-current requirements. 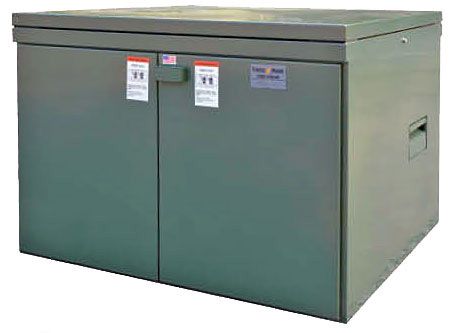 Federal Pacific 6-Compartment, Live-front Pad-mounted Switchgear (available as UL® listed) provides the convenience of installing a single enclosure with two 600-ampere switches and up to four three-phase sets of fuses. Installations with concentrated loads can now be served from a single switchgear assembly. The six-compartment configurations require less land space than two four-compartment units, which was the only choice in the past. In addition, the 6-compartment units are more economical than two four-compartment units both in initial and installed costs. There is no sacrifice in operating flexibility and as a result, an outage on the main-feeder cable can be readily isolated and sectionalized. For 8-compartment designs, consult the factory. Federal Pacific 6-Compartment, Live-front Pad-mounted Switchgear (available as UL® listed) privides the convenience of installing a single enclosure with two 600-ampere switches and up to four three-phase sets of fuses. Installations with concentrated loads can now be served from a single switchgear assembly. The six-compartment configurations require less land space than two four-compartment units, which ws the only choice in the past. In addition, the 6-compartment units are more economical than two four-compartment units both in initial and installed costs. 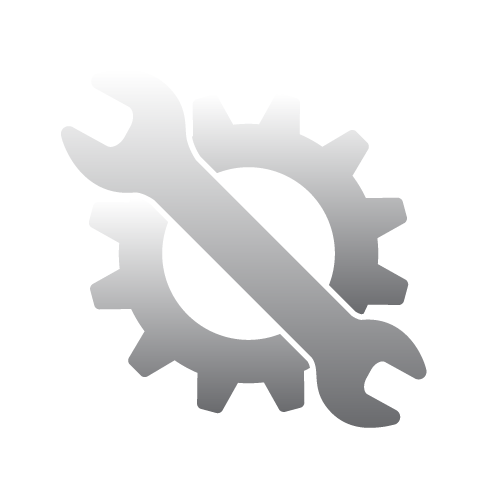 There is no sacrifice in operating flexibility and as a result, an outage on the main-feeder cable can be readily isolated and sectionalized. For 8-compartment designs, consult the factory. 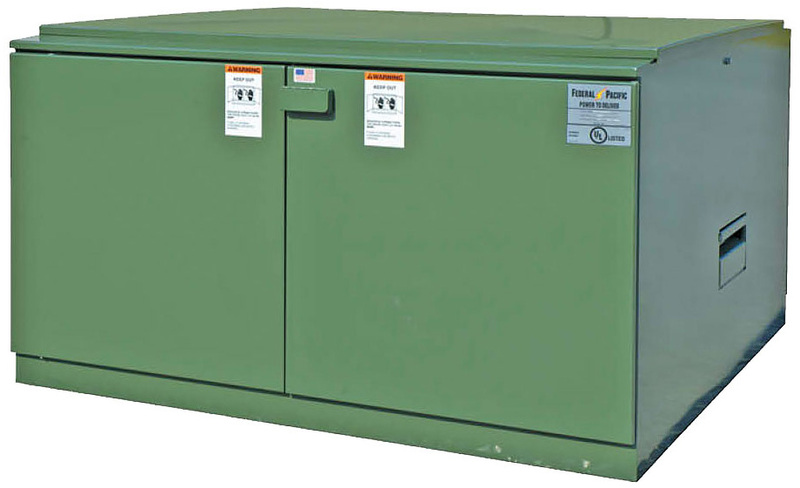 Federal Pacific Manual Dead-Front Type PSE Pad-Mounted Switchgear meets or exceed all ratings in IEEE C37.74 and with UL® listing of both 15 kV and 25 kV models. 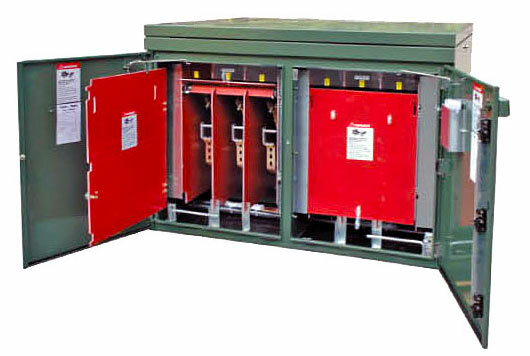 The enclosure provides increased security of fuse and switch components from environmental concerns and enhanced isolation of medium-voltage circuits to limit exposure of operating personnel. Federal Pacific PSE pad-mounts feature a low-profile, heavy-gauge enclosure with cross-kinked roof to eliminate potential for standing water. Stainless-steel hinges and hinge pins combined with padlockable, self-resetting, three-point auto-latch door security system assures durability while controlling access to the interior. Double-door construction allows clear access to elbow terminations. Ground rods that are full width of door opening make grounding of circuits and installation of surge arresters easy to achieve using shotgun clampstick. 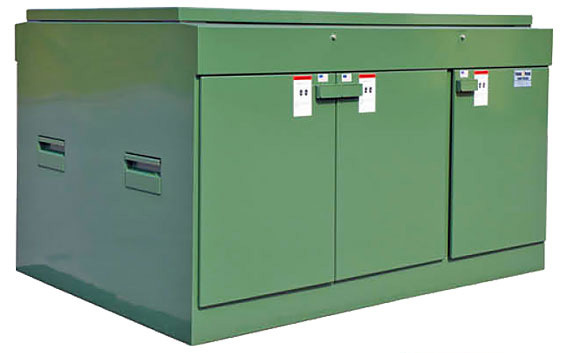 Enclosure bottom flange includes gasketing to isolate and protect the finish during installation and throughout the service life of the switchgear. Galvanized-steel floor plate on bottom of compartment containing medium-voltage components isolates interior from moisture and ingress of other contaminates. The electrostatically deposited, baked-on powder epoxy finish meets IEEE, ANSI and UL® requirements and provides a tough, durable high-gloss finish with protective qualities essential to insure long-term protection of the metal. Double-door construction allows clear access to elbow terminations. Ground rods that are full width of door opening make grounding of circuits and installation of surge arresters easy to achieve using shotgun clampstick. 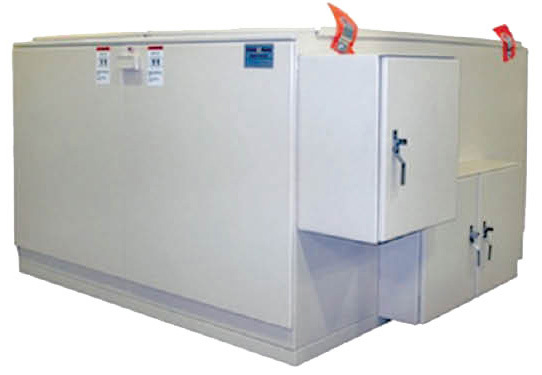 Enclosure bottm flange includes gasketing to isolate and protect the finish during installation and throughout the service life of the switchgear. Galvanized-steel floor plate on bottom of compartment containing medium-voltage components isolates interior from moisture and ingress of other contaminates. Federal Pacific PVE Models of Pad-Mounted Switchgear combine air-insulated vacuum load-break interrupters for switching of primary feeders with air-insulated vacuum fault interrupters for protection of lateral load-feeder circuits. 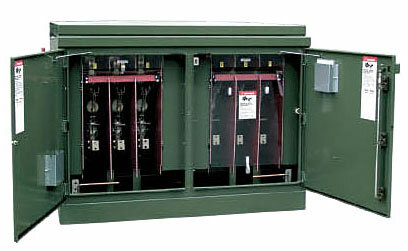 These vacuum switching and protection components are arranged in a variety of circuit configurations to provide the range of choices typically available in all other types of pad-mounted switchgear, including manual, supervisory-controlled, automatic-transfer and automatic sectionalizing (self-restoring) models. 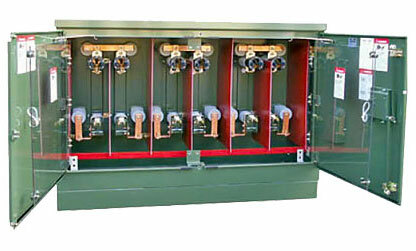 The vacuum interrupters are enveloped in a rugged 11-gauge steel enclosure with cable connections through 600 ampere bushings or 200 ampere bushing wells achieving a dead-front design with high-voltage components isolated from the environment by a galvanized steel floor plate. Federal Pacific PVE Models of Pad-Mounted Switchgear combine air-insulated vacuum load-break interrupters for switching of primary feeders with air=-insulated vacuum fault interrupters for protection of lateral load-feeder circuits. These vacuum switching and protection components are arranged in a variety of circuit configurations to provide the range of choices typically available in all other types of pad-mounted switchgear, including manual, supervisory-controlled, automatic-transfer and automatic sectionalizing (self-restoring) models. 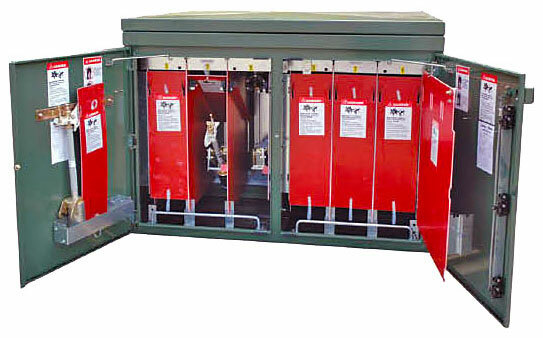 The vacuum interrupters are enveloped in a rugged 11-gauge steel enclosure with cable connections through 600 ampere bushings or 200 ampere bushing wells chieving a dead-front design with high-voltage components isolated from the environment by a galvanized steel floor plate. 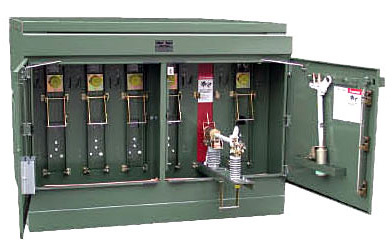 Federal Pacific offers PLD Pad-Mounted Switchgear to provide an additional switchgear equipment choice for implementing underground distribution systems. The PLD units offer the application flexibility and operating convenience of both live-front and dead- front pad-mounted switchgear. Application flexibility is achieved by providing the PLD units in the most popular circuit configurations. Operating convenience is achieved by developing a design that combines the most desirable features for terminating cable, switching and protecting main and load feeders and insuring optimum security for personnel; hence, the acronym PLD – Pad-Mounted Live-Front, Dead-Front. 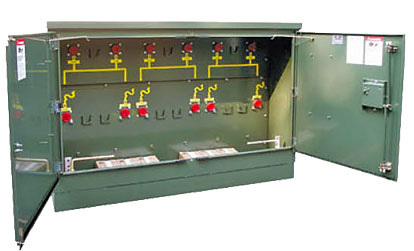 The Type FTDF Pad-Mounted Switchgear offers dead-front load-break elbow switching of radial and loop feed systems with fuse protection on laterals and taps. FTDFs are available in 15 kV and 25 kV voltage class, single and three-phase with either general-purpose type current-limiting or expulsion-type power fuses. 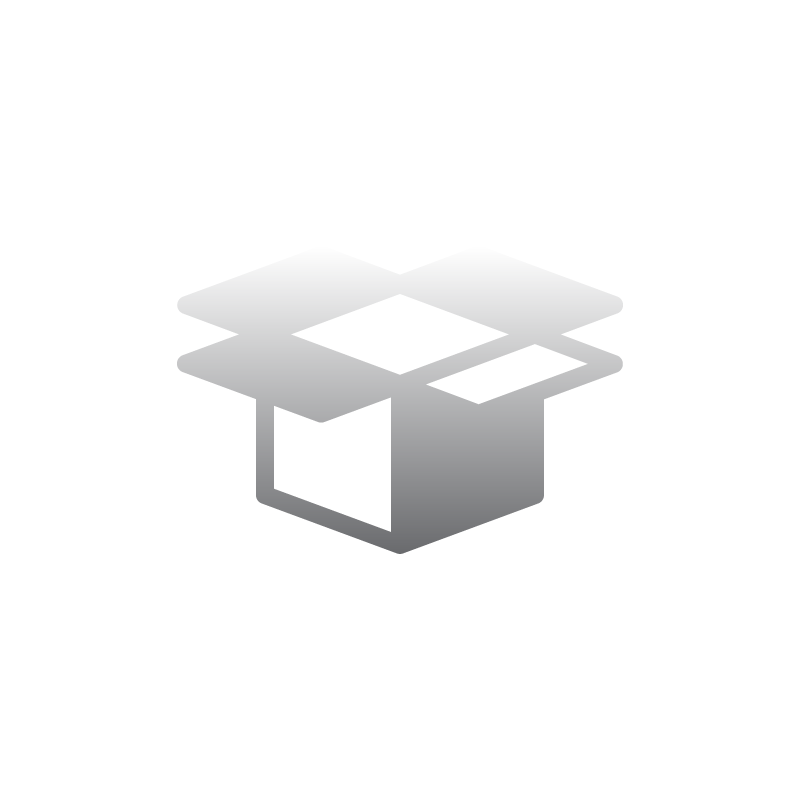 The basic enclosure has been designed to present the lowest possible silhouette, yet maintaining ample operating and electrical clearances. An all-welded 11-gauge steel construction provides additional strength and rigidity to the housing. Doors have flush handle with padlocking provisions and a separate penta-head security bolt operates with a three-point latching system. Ventilation louvers are of baffle and screen construction that allows air to circulate and prevents the insertion of wire or other foreign material. These standard features, along with a rugged tamper-resistant design provide a unit that meets the stringent security requirements of ANSI C57.12.28.